My Globe column yesterday dealt with Curt Schilling's Maynard start-up company, 38 Studios, which aims to build a credible rival to "World of Warcraft," the wildly-successful online role-playing game. The company recently doubled in size, to 140 employees, after it acquired a Maryland game development shop. Schilling and his CEO, Brett Close, are in the process of hunting for funding to finish their first big game, code-named Project Copernicus. Money could come from venture capitalists, private equity firms, or a major game publisher that would distribute the game. Here's a lightly-edited transcript of my July 14th conversation with Schilling -- which covered his role at 38 Studios, recruiting team members, and the fund-raising process. My favorite quote: "I’m not going to complain about the economy. It’s like pitching on a rainy day – the other guy has to pitch in it, too." Scott Kirsner: How is what 38 Studios is doing today different from what you thought the company would be doing when you started it? What has changed about the concept, or the company’s focus? 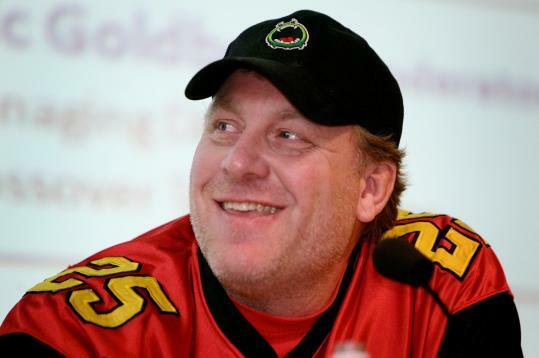 Curt Schilling: I thought I’d be playing games every day and making a game (laughs) – that hasn’t changed. The kind of game we’re doing, that has changed the least since we started: the high fantasy, massively-multiplayer, story-driven, episodic content delivery – that was always the plan. And in the end, that was the easy part – everything else was throwing monkey wrenches into it. SK: Were you the one who recruited some of the key members of the team at 38? CS: Yes. I’d pitched the idea to Bob [novelist R.A. Salvatore] and [artist] Todd [Macfarlane], because I felt like I needed their commitments to move forward with it. [CEO] Brett [Close, a former executive at Electronic Arts] was the guy who was recommended to me to run it all, through my contacts in the industry. Brett was the guy who took the longest. SK: How did you convince him to join you? CS: I wore his a-- down. It took me about six months. Brett is very methodical. People told me, “It’s gonna be hard as hell to get him to come, but once he makes the commitment, he’s there for life.” I know the first part is true – and I hope the second part is true, too. SK: What’s your role in the company? How much are you involved in management? Are you the beta-tester-in-chief there? CS: I definitely am not involved in the day-to-day management of people. But yeah, I am holding out for a beta-testing position. I do participate in play testing when we do that, because if you don’t like [the game] now, you won’t like it when it launches. My role has a chameleon aspect to it. I do whatever I need to do on the day I show up. That can be helping fundraise or having input in a design issue, which is rare. It’s a good group of people, and they understand at the end of the day that we’re not making my game. There’s a difference between making my game and making a game that lots of people will love to play. SK: What’s your work week like? Are you there every day? CS: I’m usually there Monday through Friday, usually from 8 AM to 4 or 5 PM. Today, I’m getting in a little late. [We spoke at 10 AM, as he was driving in to Maynard.] I’m every bit as busy as I ever was when I played. SK: I’ve heard that you’ve been out looking for other investors. Am I correct to assume that this isn’t a project you’re going to fund all the way until the game’s finished? CS: We’ve never made it a mystery that I’m not going to fund it from start to launch. But having said that, funding is a very private, internal thing. We’re pushing in every direction, looking in every direction. There are a lot of things happening. SK: My understanding from talking to some of the venture capitalists in town who are familiar with the company is that you’ve put at least $5 million in? CS: It has been far north of $5 million, but beyond that, we don’t discuss funding with anybody unless they’re actually investing. SK: How would you characterize investors’ interest in game companies right now? A lot of the folks locally that I’ve talked to seem to worry about investing in what they see as a very hit-driven business. CS: I think investors have always been excited about what we’re doing at 38. In the first year or year-and-a-half, we ran into a lot of hurdles. The VCs had a lot of problems with our valuation. But now that we have a playable demo, it puts us in another realm entirely. I funded the company through that traditional VC/angel investor stage. Now we’ve moved away from that stage of investment, and entered into another stage of investment at a time when the economy is what it is. There’s less money and fewer checks right now. The financial world is just much more cautious. But I’m not going to complain about the economy. It’s like pitching on a rainy day – the other guy has to pitch in it, too. It’s a challenge, no question – but that’s part of the attraction for me. SK: Do you have a time-frame or a date when you are hoping to bring in new investors? CS: Yeah, yesterday (laughs.) No, there is no date. My biggest concern from an investment standpoint is making sure that if I can qualify the investors as potential strategic investors, I do that. I look back on the last three years and know that I’ve walked away from a couple smaller checks and a couple buy-out scenarios. But even if I knew the economy was going to do what it did, I still would’ve done that over the same way.